A guitar playing poet and has been writing poems and ‘songs’ since his early teens i.e. for ages! These days it’s still what he loves to do, but now he does it for a living. So he considers himself to be a very lucky man indeed. Performances have been given in a variety of settings (from prisons to pubs, leisure centres to libraries, as well as colleges, schools, playgroups and supermarkets!). He has performed at many literary festivals including Hull, Ilkley, Lancaster and the Young Readers Birmingham Festival. His poems feature in numerous anthologies of poetry for young readers (including The Works, The Poetry Store, Wizard Poems, Pet Poems, Family Poems, Space Poems, Spectacular Schools, How To Survive School, The Secret Life of Pants!) and have been broadcast on local and national radio and on BBC’s The One Show. 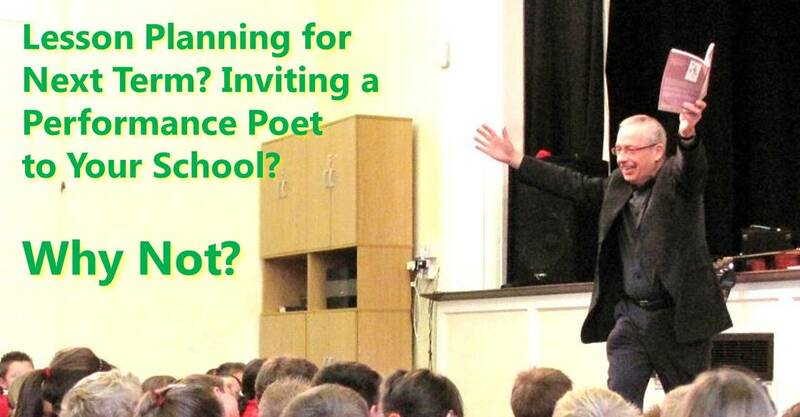 I write mostly for children and earn my living from poems and school visits. I perform, lead workshops, give talks… and I love my job. I accompany some poems with guitar and often write class/group guitar poems. That goes down really well. Great fun. I’ve also started playing ukulele so might soon be ready to bring that along too! I am listed or have work on the following sites (in some cases with other poets – though obviously it’s ME you’ll want to book! ).